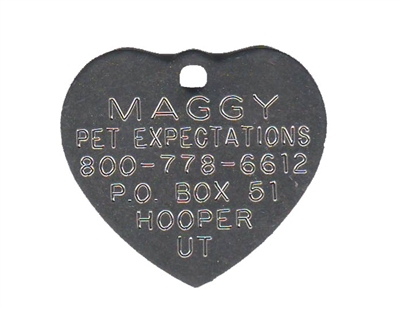 Heart Shaped tag in Stainless Steel. Lettering is deeply engraved. Each tag includes an "S" Hook or Split Ring to attach. Note: Due to the basic "V" shape of the hearts, they tend to run a little wide. The engravable area is comparable to other shapes of the same size. Margins do narrow lower on this shape. Long lines of text on lines 4 or 5 may need to be condensed to fit. This may cause those lines to have less space between characters and words. We've been buying boomerang tags for ever! I personally love them because you can engrave on both sides and I like to put more information about my puppy in case they're lost. I have never had a problem with any of these tags and I have purchased many.